North Americans have long had a love affair with Mexico. From the lush shores of colonial Puerto Vallarta, the ancient ruins of Yucatan Peninsula, the revamped and cosmopolitan streets of Mexico City to the tomb-raider like Mayan Architecture of Palenque. Mexico is far more than beautiful beaches, cheap tequila and gargantuan resorts. Ancient cultures, indigenous languages, archaeological wonders, incredible food, colourful festivals and breathtaking landscapes invite the adventurer to get under the skin of this fascinating country. With fantastic year round weather, diverse culture, and affordable options for travelers on ever budget, Mexico will never disappoint. The largest pyramid isn’t located in Egypt, it’s in Mexico! The Great Pyramid of Cholula (called ‘Tlachihualtepetl’, the Nahuatl word for “artificial mountain”), is located in Cholulu Puebla Mexico. It’s the largest pyramid in the New World (and the largest known in existence). While Spanish is the most widely spoken language, Mexico in fact has 68 (yes 68) official indigenous languages from 7 different language families. Trying to flag down a taxi in Mexico City? This bustling city is home to the largest taxi fleet in the world with some 100,000 on the streets every day. Mexico has an impressive 32 UNESCO listed World Heritage Sites and sees more than 22 million tourists every year. When trekking in Mexico’s southern jungles, keep an eye out for the elusive jaguar, North America’s largest wildcat. Because it’s built on a lake, Mexico City is sinking at a rate of 6 to 8 inches a year as pumps draw water out for the city’s growing population! Mexico is located within the “Ring of Fire,” one of Earth’s most active earthquake and volcanic zones. When you decide to strike up a traditional game of tlachtlin, a ball game once played by the Aztecs, make sure you don’t lose or you could be sacrificed to the Gods! Charter flights to Mexico generally reduce their schedules by 90% or put them on hiatus at the end of April until the beginning of October. Temperatures start to climb and in some places, the humidity can traveling the country around rather uncomfortable. September is the heart of hurricane season, so if you’re thinking of a holiday on the Gulf coast, you could run into some nasty weather. On the Pacific coast, you may not face gale force winds, but you’ll see some heavy rain. This is the start of the summer holiday season for many Mexicans and foreigners including North Americans. While the weather is not ideal (wet on the Pacific Coast and uncomfortably hot everywhere else), resort areas still see moderate to high pricing and crowded beaches. This time period being the driest, it’s also when the Northern Hemisphere is looking to escape the bitter cold. Christmas, Spring Break and Easter are peak travel times with availability low for those who don’t plan well in advance, and high pricing for all accommodation types. Visit the world famous Mayan ruins of Chichén Itzá, an impressive complex on Mexico’s Yucatán Peninsula dating back to 600 A.D.
Head to the Río Secreto in Playa Del Carmen and explore an underwater river with some of the most dramatic stalactites and stalagmites anywhere on Earth. 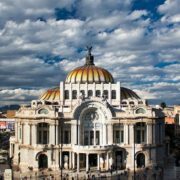 Visit the Palacio de Bellas Artes in Mexico City, an exquisite white-marble palace housing larger than life murals by the world’s most famous Mexican artists. Take a day trip to the ancient Mayan capital of Palanque – A UNESCO World Heritage site also home to two world-class waterfalls (Aqua Azul and Misol-Ha). Visit Isla Mujeres and spend an afternoon or two on Playa Norte – With crushed coral beneath your feet and blue and raspberry coloured waters a few steps away, you won’t want to leave. In the modern city of Tlaxcala lies one of the most serenely beautiful pre-Hispanic cemeteries in the country, perched on the foothills, in the shadow of the gargantuan Cerro Los Metates outcrop. There are only a handful of places on Earth you can swim with the world’s largest fish, and off the coast of Isla Holbox, in the months of July & August, is the absolute best place to find Whale Sharks. 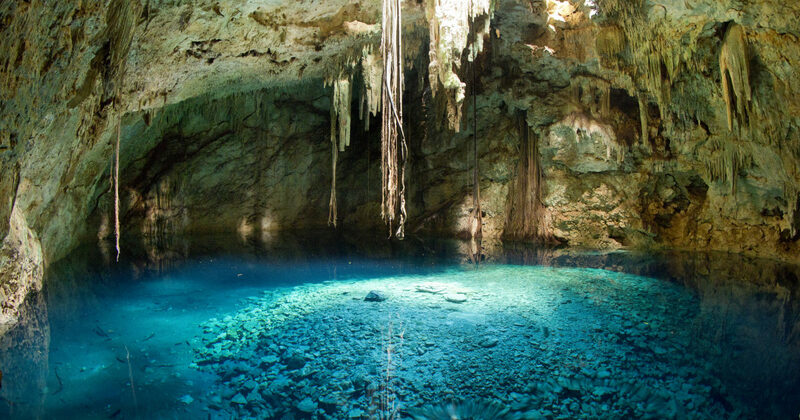 Ancient ruins, pristine cenotes and vibrant culture are just a click away - Let’s start planning!